Is Earth Day still celebrated? 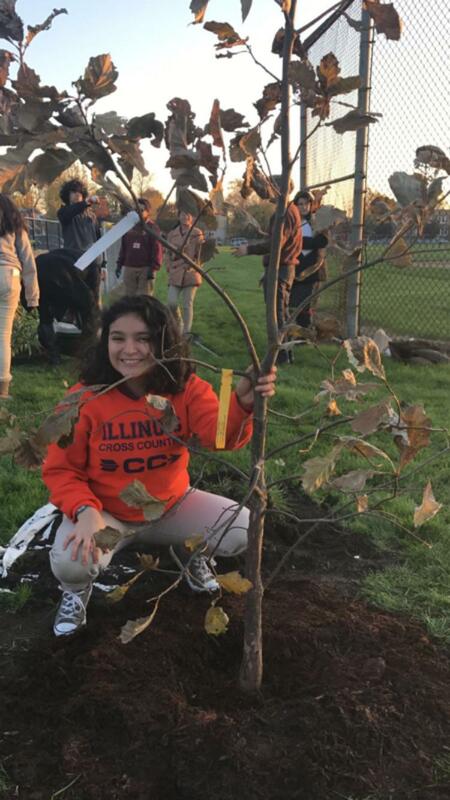 Angela Hernandez planting a tree outside the Morton East field with her classmates. On April 22, 1970, 20 million Americans from all walks of life protested environmental issues. In the 1970’s atmospheric pollution’s was becoming deadly and evidence was growing that pollution led to developmental delays in children. The U.S Congress and president Nixon responded quickly and in July they created the Environmental Protection Agency, and robust environmental laws such as the Clean Water Act and the Endangered Species Act. Earth Day is an annual event celebrated on April 22, many people gather around the world and do acts of kindness to earth like pick up trash, recycle water bottles and plastic bags. A survey conducted at Morton East High school, Morton East students were asked if they celebrated Earth Day, 45 out of 100 students answered yes, and their responses were very gripping. “The way I “celebrate” is by going vegan for a week. I also like to use as little as technology as possible that day. Anything helping climate change for sure helps, but i feel like the bad outweighs the good so i guess it technically isn’t helping much. Earth day is important to me because it serves a reminder to those who forget that we do only have one planet and we are running out of resources. We use more than our share-at this rate, who knows how far we’ll actually make it,” junior Monica Martinez said. Other students agree that people should protect the environment. “I always find new ways to reduce my plastic waste, and I do believe campaigns help fight against climate change. Our planet is truly a magnificent place; it’s where living organisms interact with each other and their environment to create the ideal conditions for life,” Angela Hernandez said. Others believe that Earth Day should be celebrated daily. “I always see people on the internet saying “Happy Earth Day”, but there’s not much change going on so why are people saying that? Individuals should educate others on the importance of keeping the earth clean every day. People should actually be doing it daily, like picking up trash or recycling shouldn’t be done just one day out of the year. I see so many people on the internet saying they did something good for Earth Day, but what about all the other days?,” senior Adriana Acevedo said.